Bony Spirits and Fleshy Souls. "Travel back in time to 60 years ago!" But he has a weird wristgear. Why are we going back to 1956? Didn't the first game, like, just come out? Is it so Yokai can fight Jim Crow laws? There was a large gap between Japan's release and America's. So was it not localised yet? Well there's a cartoon and everything. I think it sold about 400,000 units IIRC. 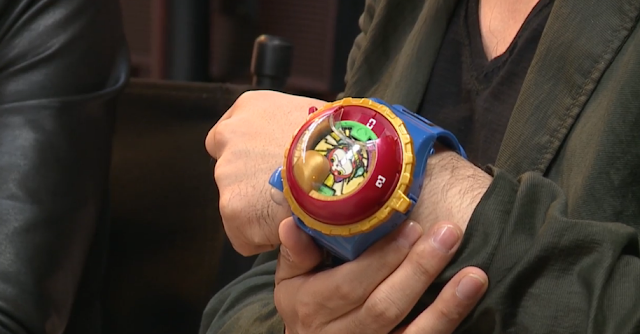 To be honest I had no idea "Yo-Kai Watch" meant an actual watch. The titular YO-KAI WATCH itself, model 0. I thought it was Watch like, sentry. Sam asking Japanese dude to explain for the Americans. Well Sam said "some of our viewers"
I don't like the designs of these dudes. which the translator translated as "Americans"
There was a Yokai in the trailer that was just an overweight human. "Yo-kai are not monsters, creatures, or ghosts. They kinda are like ghosts, but they each have their own personality and charm." It's out September 30 and not localised? "We're still developing the English-language version of this game." Inanimate objects with female legs is probably a weird Japanese trope. 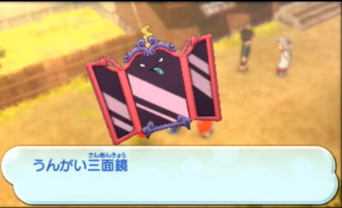 Yo-Kai Watch 1 has a 3DS eShop demo. I'm gonna call it Mimicutie since I'll never learn these things' names. I just never played it because the game requires the L and R buttons and I downloaded it on my old 3DS. I guess there's Yo-kai Amie. Sam talking about always doing something during battle. Treehousers are obsessed with this point. I assume they hate All-Star Rest Areas. They really like this blue cat in a cape. But I guess it's not named in America yet. "Nate" is the dude's name. So I dunno what to print-screen or how to name stuff. When they mentioned "Nate's grandfather" I thought they were talking about Bihldorff's. Sam thinks the original Japanese is hilarious. I was gonna ask you what's happening, but I know you wouldn't know. Speaking of these Yo-kai designs. I knew the watch was a watch. That makes me glad there's no Pokemon based on flatulence. WHAT'S GOING ON THE STREAM RIGHT NOW? @NintendoUK And people say Gen V Pokémon are stupid"
Uh...rawr? Maybe it's not a mirror, since this isn't showing my lovely face. "one of the most funnest parts of development"
"Let's have a Yo-kai based on farting!" "Great! Build the design around that!" Did we have more fun watching Star Rush? The only person I know who plays it is Samantha Lienhard. Maybe she'll leave a comment. Yeah I liked Star Rush more. I liked Breath of the Wild more than anything else shown today, too. Maybe Nintendo should've only had one game after all. Yo-Kai Watch had an open world, and Yo-Kai Watch 2 wants to expand on that with TIME TRAVEL. Well we're only saying that now that we've seen the alternative. Every kid in Japan knows about the Yo-kai. they keep using the term "Yokai-Watch Original Yokai"
That's almost as clunky as "Super Saiyan God Super Saiyan." Does that mean it's a Yo-kai that first appeared in Yo-Kai Watch 1, or a Yo-Kai Level 5 made up for the game and not from Japanese mythology? See, I KNEW asking you is fruitless. Both of those seem equally plausible. KoopaTV has over 5000 comments now. Oh, they have a new mode. Did they say four player co-op? The players play as yo-kai. The audience is really rowdy. 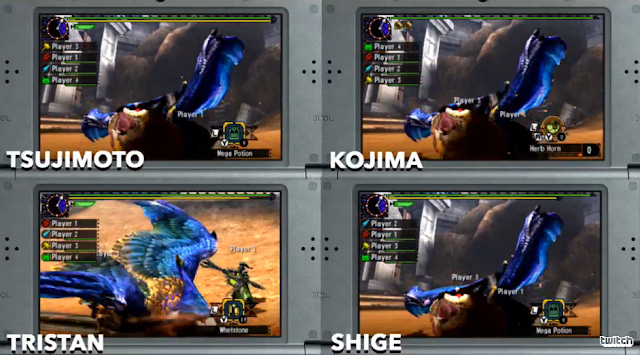 In Japan, four-player co-op is literally a different game. I thought they were "almost out of time." I'm scared of what's next. I has to be better than this. Did Chicko just mention Mother Teresa? I like how the only think we've been remotely agreeable towards was appropriately titled "Oasis". They remind me of TWEWY's. We're just about out of time, again. "in a second we're coming back"
A bunch of Japanese dudes. and they don't look happy. "Tristan! Talk to me man." New areas, new story, new monsters. Customised hunting experience. Got 'em hunting styles, and Hunter Arts. does that dude's shirt say "Die"? No rainbow ribons for CAPCOM dudes. DIE. Guess that'd be weird with a rainbow ribbon. I liked that trailer music. NO ONE here has rainbow ribbons. Well, a "BBQ Spit" shirt and a rainbow ribbon are obviously mutually exclusive. The game is coming out a month from now, so at least this is in English. So we could all buy this game as a staff and play it together. Since Vortexica isn't getting a Wii U. And we wouldn't play the Wii U Monster Hunter which is sooo much better. 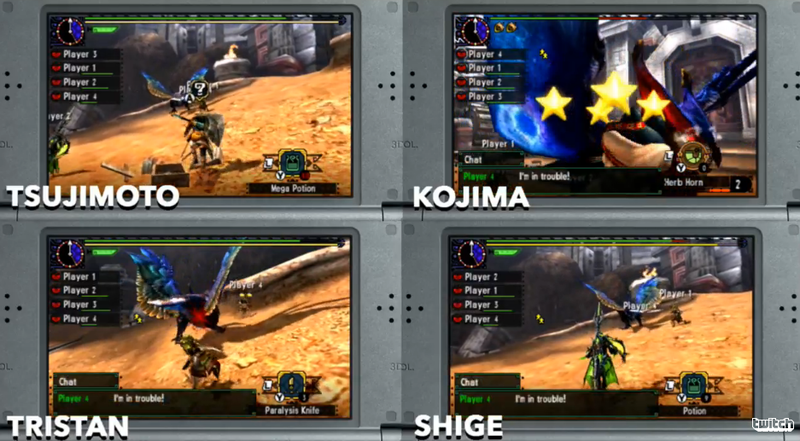 Oh hey they have labels about which 3DS is which person. How come they couldn't do that for Star Rush? Gonna assume the Kojima isn't actually Kojima. They said they've taken feedback from Monster Hunter 4 on Wii U. Something about hitstun I dunno. Better than Yo-Kai Watch 2. So is this chat auto-chat? After the 10th minute of four dudes ganging up on the same bird we'll be zoning out I imagine. I'm watching Kojima since he looks like he's playing as a giant chipmunk. Kojima has stars in his eyes. 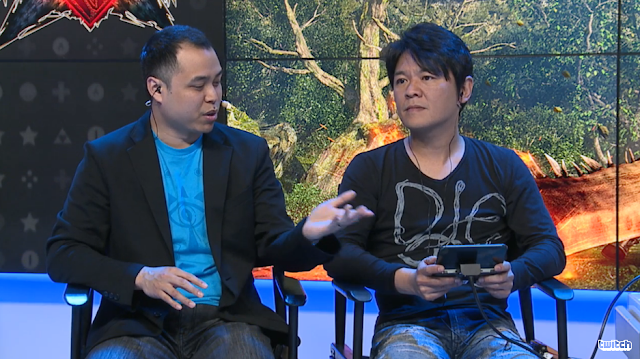 Are they chatting about Zelda? Monster Hunter guy got a "VIP" experience with Breath of the Wild. Speaking of Zelda, I like to think they're imagining that owl is Kaepora Gaebora, to give them added incentive to wail on it. ...yeak Rawk's right about this thing's watchability. Apparently he couldn't finish Zelda in time. So he wants to beat the bird before stream is over. I'm literally playing Pocket Card Jockey right now. And have been for a while. June 30th, demo will be available on eShop. Distribute 2 codes to 3DS owners via e-mail. Oh, "Monster Hunter 4 U" is "Monster Hunter 4 Ultimate" not "Monster Hunter 4 Wii U"
Coming up next Dragon Quest 7! Okay guys, THAT should be good. The other staffers want Ludwig to stop jinxing the games by saying they'll be good. Stay tuned to see if Dragon Quest VII: Fragments of the Forgotten Past is any good. 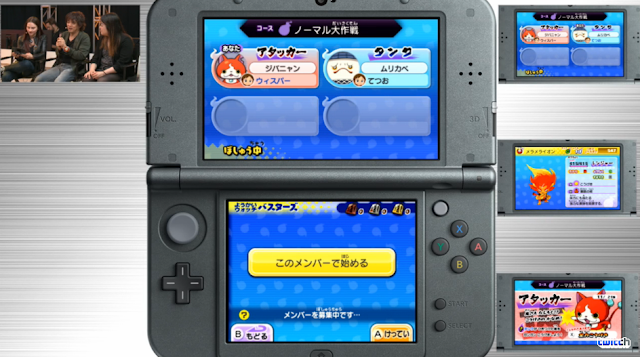 Since we seem to think Mario Party: Star Rush was a better log, you can read that one here. Yokai Watch only wishes it was as successful as Pokemon. Now, people say Yo-kai Watch 2 has a much better story, and I get that impression just from what they showed today. They also improved the catching (okay, "befriending," not "catching") mechanic, so that shouldn't be as annoying. I didn't see enough of the map to judge it. But overall, I'm excited for Yo-kai Watch 2!